We are third-generation farmers on both sides of the family. We produce maple syrup and sell retail, wholesale, and mail order. Stop by in March when the sap runs and try our maple cream, maple candy, and maple granulated sugar. Native, pre-cut Christmas trees are available in early December through Christmas Eve. 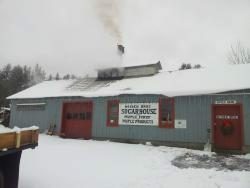 Retail store is open weekends in December until Christmas as well as during sugaring season. Call or email us anytime for details.